The CMA has mandated, through secondary legislation and licence changes, the introduction of Transmission Loss Factors for each TLF Zone. This was initiated by P350 and implemented from 1 April 2018. Losses on the Transmission System are allocated across BSC Parties through the use of Transmission Loss Multipliers (TLMs). The Balancing Mechanism Reporting Service (BMRS) is the primary channel for providing operational data relating to the GB Electricity Balancing and Settlement arrangements. Data is available via the ELEXON Portal but we have produced a dedicated web page to highlight all the relevant data, upcoming data timeline and implementation guidance. 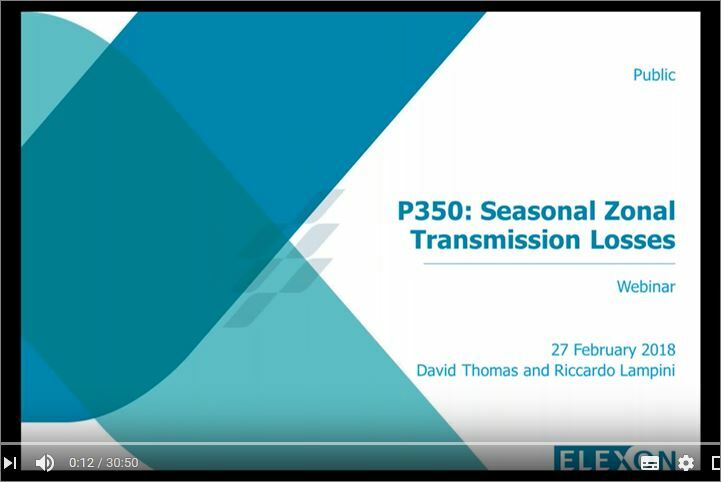 This is in response to Modification P350 ‘Introduction of a seasonal Zonal Transmission Losses scheme’ which introduces a Transmission Loss Factor (TLF) for each TLF Zone and BSC Season. Estimated Transmission Loss Adjustment (ETLMOs)’ Historic Estimated Transmission Loss Adjustment (ETLMOs), are indicative parameters set for the purposes of Balancing Mechanism Reporting Service (BMRS) reporting. These parameters are the estimated values of the ‘Delivering Transmission Losses Adjustment’ (TLMOj+), and the ‘Off taking Transmission Losses Adjustment’ (TLMOj-). The ISG reviews the ETLMO values annually on behalf of the BSC Panel. Under the BSC arrangements, TLMs are applied to non-Interconnector Balancing Mechanism (BM) Unit Metered Volumes as a means of scaling to account for losses on the Transmission System. Interconnector BM Units are assigned a TLM of 1 and are exempt from Transmission Losses. Transmission Losses on the System is defined in the BSC as the sum of BM Unit Metered Volume over all BM Units (with BM Units that import having a negative value of BM Unit Metered Volume). The formulas for calculating TLMs are set out in BSC Section T, Paragraph 2.3.1. The TLM adjusted Metered Volume for each BM Unit is described as the BM Unit’s ‘Credited Energy’. In accordance with BSC Section T, Paragraph 2.2, the Transmission Loss Factor Agent (TLFA) determines every year the Transmission Loss Factors (TLFij) for each Zone and for each BSC Season. The Offtaking TLM applies to all non-interconnector BM Units that are part of an Offtaking Trading Unit. The Delivering TLM applies to all non-interconnector BM Units that are part of a Delivering Trading Unit.